Eating disorders such as bulimia nervosa trigger compulsive overeating such as binge eating making it harder to diet and difficult to lose weight. Bulimia nervosa is a term used to describe compulsive overeating such as binge eating. That's what "compulsive overeating" is, eating too much to eat. The standard definition for bulimia is uncontrollable anxiety dealt with through purge eating not to be confused with eating disorder anorexia or anxiety attacks. 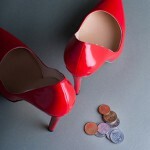 So what separates mere compulsive overeating from bulimia nervosa? Compulsive overeating is that anyone has it, but "the bulimia nervosa" here is different from mere compulsive overeating. If you feel so depressed and very anxious about things that you find yourself compulsive overeating, then you may be experiencing the early signs of bulimia nervosa. If there is a strong influence anxiety and self-loathing, and depression of mood, but also in mind, there is a possibility of bulimia nervosa. You would be surprised how many normal people life with bulimia nervosa not knowing they need help. Some people might also be adversely affecting the heart even compulsive overeating, not aware of it yet. Getting yourself diagnosed and treated promptly is a must. Early detection and bulimia treatment is important as well bulimia nervosa. We will continue to check for bulimia nervosa Symptoms, causes of bulimia nervosa and treatment. In this Slism we will discuss what bulimia nervosa is and its symptoms, causes of bulimia, and bulimia nervosa treatment emphasizing why it is shouldn't be treated as mere compulsive overeating. If after reading you find that you need help please consult with your local health care provider regarding the roads of treatment you need to take. I will get to be the cause of obesity is eating too much, however, since we're more and more calories. What is bulimia nervosa and how does it differ from anorexia? But many of the people of bulimia nervosa are not obese. There are many people about of the normal weight. This is because there is bulimic compensatory behavior such as self-induced vomiting or for after compulsive overeating, do not increase the weight. Self-induced vomiting is vomiting spontaneously. Since it will grow fat if it overeats, it is made not to grow fat by spit out. Since the spit with his finger in the mouth, you may be able to be in the hands vomitcallus formed. In order to prevent the fat in compulsive overeating, we discharged with diuretics and laxatives. Also diuretic laxative as well, because the drug would not be effective with a tolerance and abuse, you may want to use the drug several times the normal usage. The following are features as compulsive overeating. Bulimia nervosa is not a "simple diet trouble." 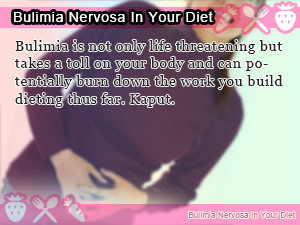 Cause of bulimia nervosa is mainly mental stress. The cause of the stress which causes bulimia nervosa, such as a burden, bullying, etc., such as a trouble and study, such as human relations and family relations, and lessons, is up to persons. In some cases, such as a failure to develop when the exam and heartbreak, extremely depressed. In addition, the pressure will be strong expectations of parents; you may want to develop bulimia nervosa. The bulimia nervosa could also say a drastic diet as one of the causes, although stress becomes a cause. It is because a drastic diet will be a cause which shows the symptoms of bulimia nervosa. In recent years, it is also called "stress society" and everyone is holding stress to some extent. It may be said that anyone has the possibility that bulimia nervosa develops. Although it is important to relieve stress, it is also necessary not to bad diet will trigger the onset. Repeat or eat that vomit, eat that vomit, eat in excess or take laxatives five times the amount used. There is no reason to continue to bulimia nervosa such, no effect on the body. And adverse health effects due to disturbance in the balance of nutrition, and adverse effects on the health of the teeth due to repeated vomiting, have adverse effects on the heart. Include electrolyte abnormalities, renal dysfunction, anemia, low blood pressure, low body temperature, chills, swelling, constipation, and amenorrhea. Repeated vomiting, tooth would sorely by stomach acid. Tooth decay or increase, which will cause tooth discoloration or deformation. May cause mental disorders such as mood and anxiety disorders and emotional instability, which may lead to drug dependence and alcohol dependence and suicidal. Cognitive behavior therapy, an interpersonal-relations treatment, etc. are performed for the medical treatment of bulimia nervosa. Many of those who show the bulimia symptoms of bulimia nervosa have the features, like a perfect principle and self-valuation are low and it has produced the vicious circle to action by this view in many cases. It leads by medical treatment so that these can be controlled by themselves. Not only the body but medical treatment of the heart is performed, and bulimia nervosa is improved. Also, if you are concomitant mental illness, drug treatment may be carried out with such antipsychotic. This does not mean there is a magic bullet for bulimia nervosa, bulimia nervosa only drug treatment does not cure. Is stress making you hunger again? Don’t let it control you anymore. Prevent your diet from performing a downward spiral. Battle obesity the right way now. How do I stop being hungry without eating? The secret to satisfying your hunger without losing control over your appetite may as well be adrenalin. Bulimia is not only life threatening but takes a toll on your body and can potentially burn down the work you build dieting thus far. Kaput. Don't cheat on yourself! – The work you put in is the work you get out as they say in a perfect world. Eat right and results will surely show. If you've got a friend in your body, then you've got to do something about the enemy compulsive overeating before some bad happens.